Back to the rolls, like I said, I found the recipe online, can't remember where I got it. If you google “Lion house rolls” there will be several recipes that pop up. We have made it easy and you can get it right here! 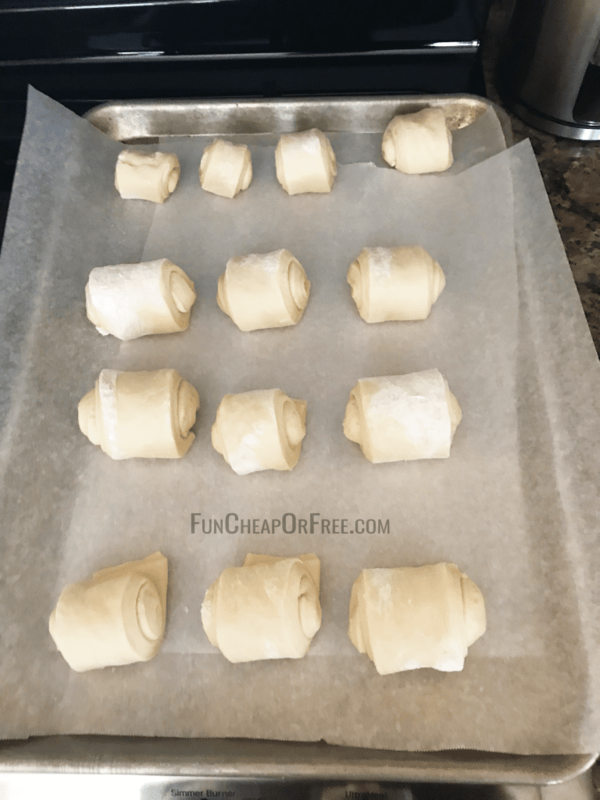 In terms of making rolls, I think this recipe is super easy. I generally hate baking, the mess, the measuring, following the exact directions, drive me crazy! But, this I can handle. Plus I make a super amazing honey butter that my whole family goes nuts for, even my brother who hates butter. In a stand mixer, or large mixing bowl, combine the dry milk (when I measure it out, I just put it straight in the bowl) and water, mix until milk dissolves. I use a whisk attachment when doing this. Add yeast, then sugar, salt, butter, and egg. I usually mix the yeast in, let it mix for a few seconds, then as the mixer is still going add the rest of the ingredients one by one. Turn off mixer, and add 2 cups of flour, still with the whisk attachment, mix the flour on low until incorporated, then mix on medium speed for two minutes. At this point I switch out the whisk attachment for the dough hook attachment. Add 2 more cups of flour. Follow the same process, mix on low until incorporated, then mix on medium for two minutes. Add flour, 1/2 cup at time (you made need to knead by hand if dough is hard to mix) until you get a soft, smooth, not stiff dough. It shouldn't be too sticky. Sometimes I have to had more than 5 1/2 cups flour. I coat another bowl with about a tablespoon of vegetable oil, and add my dough, turning it around in the oil, so it is covered. Cover with plastic wrap or towel and let rise about 45 minutes, until double in size. Flour your counter or board, and coat your dough in the flour. 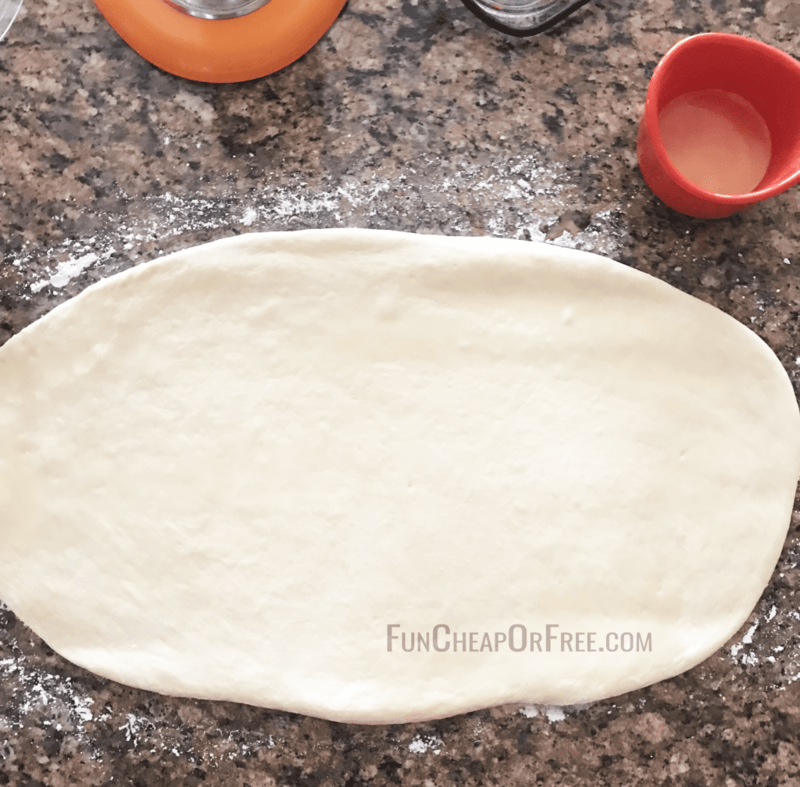 Flatten dough and roll out in a rectangle, about 18 inches long and 9 inches wide, it should be about 1/4 inch thick. Brush the dough with melted butter, and cut the dough in half long ways. So you have two long strips, then cut the opposite direction to have two inch strips. Roll each strip up, and place seam side down on a sheet tray, lined with parchment paper. You can place them as close as you want, I usually do about 4 across, and as many rows as I can. My rolls, always come out different sizes. Cover with plastic wrap, and let rise 1 to 1 1/2 hours. Bake at 375 for 15-18 minutes, until light brown. Brush with melted butter, YUM! I measure out all my ingredients first in cups like these, then I can just pour them all in. For the yeast, I just get the jar of yeast, it's easier to measure out than the packets. Use a pizza cutter when cutting roll, it makes it super fast. Or you can portion out the rolls in balls, and place in muffin tins or just ball shape on the cookie sheet, which I have done when I didn't have counter space to shape them. But, they look super pretty when you roll them. I use these pre-cut parchment paper sheets. They are perfect for pans like these. That's it! Once you make them, they are super easy, and delicious, you will want to keep making them. 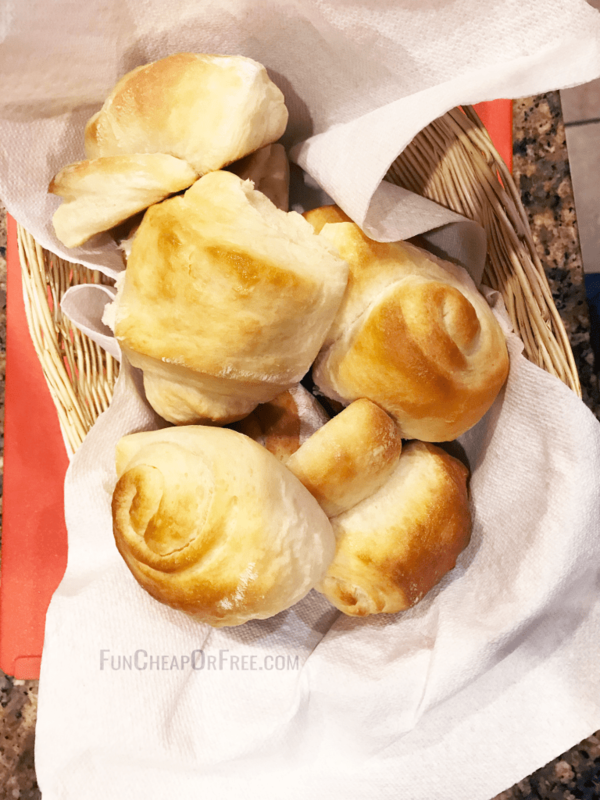 I have never tried another roll recipe to compare, but I don't need to, these are the best homemade rolls. 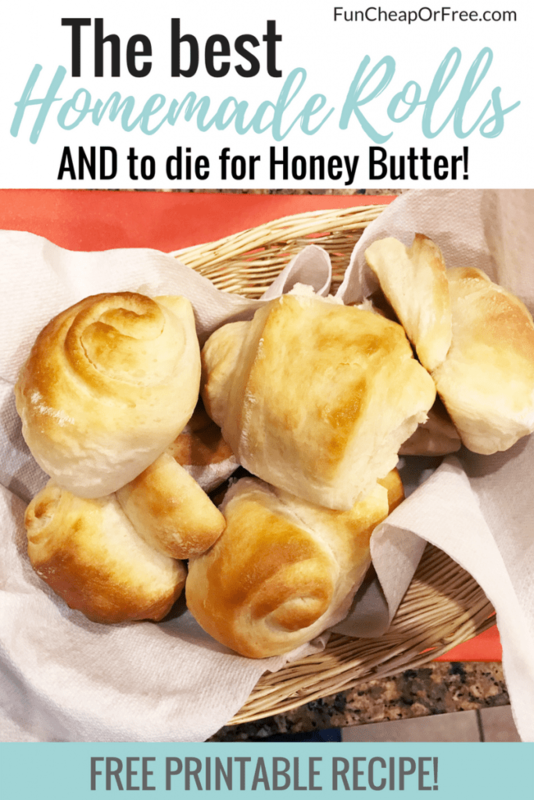 Oh wait… you probably want the honey butter recipe too! 1/4 cup or so of honey. It really depends on how sweet you want it. I generally eye-ball the honey. add butter and start to mix for about a minute (you can either use a whisk or paddle attachment both work great) until butter starts to get light and fluffy. add vanilla, mix for a couple seconds until vanilla is mixed in. mix for about 20 minutes on low, until butter is super soft and airy. Spread on your homemade rolls and enjoy! Don't forget your free recipe printable HERE! I enjoy baking rolls on a regular basis. So I will definitely try this yummy recipe. Thanks for sharing. These recipes look amazing!!! Gonna try them as soon as I can talk my grand into kneading the dough lol. I’m unable to do things like that anymore but maybe I can convince her to help me. What if we don’t have dry milk?? Can we use regular milk ? Have you tried this with regular milk? Did it work? I need to make these this weekend. I’ve made these twice. The family loves them. Thank you for all you do. Wow!! This does seem easy! I don’t usually bake breads but I will try this! Thanks KS for sharing!! Rolls and honey butter remind me of Sunday dinners in Utah. Sounds so yummy! I have to try! Yummy! I am going to try these on Sunday! I have literally never successfully made homemade rolls! I will have to try this recipe asap. Can’t wait to try these! My grandma made these for Thanksgiving every year, but they took 12 hours! This will definitely cut down on the time! These sound so yummy. I’m kinda afraid to try to make em. Tried the banana recipe n failed😣😭😭😭😭😭. Terrible baker. Totally trying those this week! Cannot wait to try these babies!!! Need to make some honey butter asap! I love to bake from scratch. These rolls look yummy and easy. I love to watch you cook sometimes because you cook like I do, you don’t measure you eye ball it!! It drives my friends crazy when I don’t have a recipe. I just wing it!! I love rolls, I definitely need to try this! Do these rolls freeze well? Also, the honey butter sounds amazing, like addicting amazing! Honey butter is definitely a favorite around our house! Can that be frozen too? They look amazing! Might have to try these for the next holiday. This honey butter will make a perfect addition. I can’t wait to try these. These look so yummy! I’ll be trying your recipe! Delicious! Can’t wait to give this a roll… haha! Yum! oh my gosh! my husband will be SO GLAD i found this. yummy! Love honey butter with warm rolls. I have been on the hunt for an amazing honey butter recipe. Thank you! Can’t wait to try these recipes! Love homeade rolls and honey butter! I never thought of rolling them up! What a brilliant idea! Thank you so much for sharing! Definitely going to keep the honey butter recipe close by! I love homemade rolls. I can not wait to try these. And I am very excited to make the honey butter also. These are sooooo good. I make them every Thanksgiving too!! Sounds delicious! Definitely trying this for Easter!! Yumm!! Can’t wait to try these! Honey butter is the best!! I am so excited to try these! Thanks for the easy recipe! OMG!! These sound sooo amazing! I need a good go to fill recipe, can’t wait to try this! I’ve been looking for a good roll recipe. Thanks. Oh, yum! I could eat all of these. Thanks! I always love a good recipe! How have I never known that honey butter is that easy?! Going to have to make these tonight! Sound delicious! Definitely adding this to make list of things to try! Oh my gosh I made these and they are SOOO GOOD! !